First released in October 2017, the Surface Book 2 lineup has attempted to take on the MacBook Pro and iPad Pro lines by offering both the functionality of a tablet and a notebook using a detachable keyboard, while at the same time offering as much performance as possible. On Sunday, Microsoft finally made an update to the device range's smaller model to make it more attractive to customers looking to acquire a MacBook Air. The 13.5-inch model was previously offered with a 7th-generation dual-core Intel Core i5 processor clocked at 3.2GHz, or optionally with an 8th-generation quad-core 4.2GHz processor. As part of the changes, a third option is now available providing an 8th-generation Core i5 i5-8350U, a quad-core chip clocked at 3.6GHz. Combined with 8 gigabytes of memory and with 256 gigabytes of storage, Microsoft is selling the 8th-generation Core i5 model for $1,499, the same price as the original lowest-specification model. The 7th-generation Core i5 is still being sold with the same memory and storage, but at $1,299 instead of $1,499, and with a 128GB storage option bringing the lowest-cost option down to $1,149. The Intel Core i7 variant, equipped with 16 gigabytes of memory and options for 512 gigabytes or 1 terabyte of storage, is still available at $2,499 and $2,999 respectively, with no changes made to the specifications. The 15-inch model, starting from $2,499, also has no alterations. The 13-inch model houses a 3,000-by-2,000 10-point multitouch display, powered by integrated Intel HD Graphics 620. 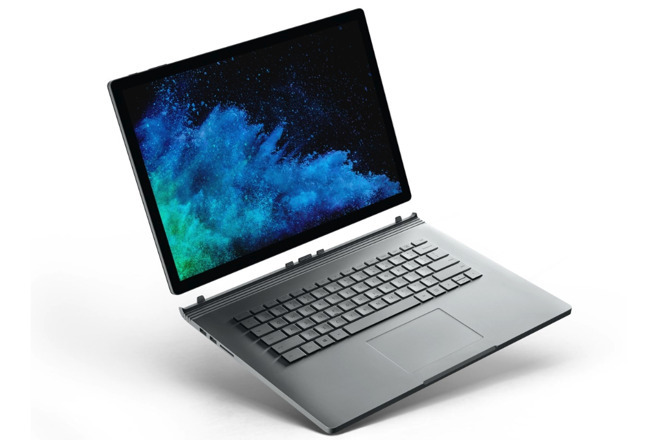 Said to offer up to 17 hours of video playback, the magnesium-cased machine also includes 5-megapixel front and 8-megapixel cameras with Windows Hello face authentication, dual microphones, Dolby Audio stereo speakers, Wi-Fi, Bluetooth 4.1, and support for accessories like the Surface Pen. The keyboard section provides extra ports and battery capacity, adding an extra five hours to bring the usage up to the stated 17 hours. The full list of ports includes an SDXC card reader, two Surface Connect ports, two USB-A connections, one USB Type-C 10 Gbit/second port with Power Delivery, and a headphone jack. At its lowest, the latest model is likely to be attractive to general computer users who want a Windows notebook, though it is unlikely to pull people away from buying a MacBook Air. Apple's base notebook has a dual-core 1.6GHz Core i5 chip, 128GB of storage, 8GB of RAM, a lower-resolution 2,560-by-1,600 non-touch 13.3-inch display, and two Thunderbolt 3 ports, but while it is $50 more than the cheapest available Surface Book 2, users may find it benefits from being a more tried and tested design, as well as being willing to pay only a small amount more to own the more premium-branded hardware.